Affiliatewolf is one of the very first serious bitcoin affiliate networks. An affiliate network is a type of ad network, where publishers and advertisers are entering into a partnership one by one. Publishers can apply for single advertiser programs. The other way round, advertisers can invite specific publishers to participate in their affiliate program. The most common campaign type at affiliate networks is CPA, which means publishers are payed per action, Usually per sale or per new customer lead. 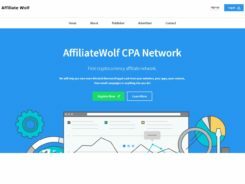 Affiliatewolf.com is a globally operating bitcoin affiliate network which offers to advertise in more than 200 different countries. They don’t have a list of specific categories to choose from when creating a new campaign. You can fill in just any category fitting your offer. The bitcoin affiliate networks accepts Bitcoin, Etherium and Paypal. Additionally you can claim your withdrawls also as check or wire transfer. Fill in these details in the „Payment details“ field when signing up. The registration at affiliatewolf.com requires lots of personal data, just like at any other affiliate network as well. They need your name, address, e-mail, password, pament method, payment details such as your bitcoin wallet address or paypal e-mail address. The fees are a certain percentage of the CPA and are payed by the advertisers. CPA: Publishers get payed for Sales, Leads, Signups or other specific goals. Creating campaigns is fairly simple. You just need to fill in the campaign name, a description, the offer URL, how much you pay for leads, payout details, select the country, your device targets and finally fill in the category. Then just click on the button to create the campaign. When publishers find it in the campaigns list, they can choose to advertise for your campaign.